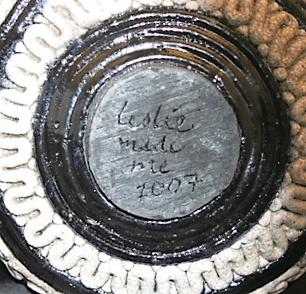 I have been hand-crafting ceramic pieces for three decades. I started working with clay in 1977. My award-winning designs are one-of-a-kind works of art. My coil vessels combine discipline with imagination. I begin a piece by imagining its form and sketching a profile. I transfer the profile to a cardboard template which I use to check the shape as I build the pot. When my work is in progress, I am filled with a sense of “flow,” which for me is a sense of satisfying concentration during which I lose track of time as I create my imagined form. While I begin with a disciplined notion of form, I never have a preconceived idea about the coil patterns. The undulations of the coils emerge spontaneously as the work grows. All of my early coil vessels feature hand-rolled coils. The early pieces were all high-fired to cone 10. Transparent high-fire glazes, or a simple iron oxide rub completed these early pieces. My more recent pots were all made with extruded coils using a hand extruder (like a caulking-gun) and raku-fired. Clay was and will always remain my first love, but in 2007 I found another creative outlet in knitting. My sister-in-law came for a Thanksgiving visit. During her stay, she taught me to knit and I’ve been going strong ever since. For me knitting is kind of like cooking; if you can read and follow directions, you can cook any recipe or replicate any knitting pattern. The fun comes in the deviations and substitutions - - choosing different yarns, combing yarns together, adding embellishments. As a leadership development consultant who travels a fair amount for work knitting’s portability enables me to keep busy in airports and on airplanes. Another great thing about knitting is that your project never dries out, so you can have several going at once, and you don’t need a kiln.